~Visit me at BOOTH 412~Reveal the hand-woven JEWEL that is meant for only you. mention this post to receive 25% off your entire show purchase! Happy Birthday, July!Let's celebrate the beauty of the Ruby, your birthstone and one of the most popular gemstones on the planet. What is the first thing that comes to mind when someone says, "Ruby?" Is it the infamous Ruby Slippers? The gemstone's bold, red-magenta color? Maybe you think of your Valentine, or get those fiery feelings of love and passion? Whatever you feelings or thoughts, it's interesting to know that Rubies have held a place in human history for thousands of years. The ancient Egyptians held rubies in the highest regards and placed them in the crowns of their Pharaohs. The deep red color of a Ruby makes the stone look bigger than it actually is, which may have been one of the many reasons why ancient people believed so strongly in a Ruby's medicinal powers. Ancient medical writings from India suggest that rubies cured diseases of the digestive tract. Burmese warriors carried Rubies INSIDE their skin to protect them from being slain in battle. Many other cultures still view rubies as a symbol of peace, and believe that wearing a ruby on the left side of the body prevents conflict when among enemies. Burmese Rubies are the most prized, but new deposits of Ruby are still being found. Rubies that have recently been found in Vietnam are so much like Burmese Rubies that they are believed to have been formed by the same geological event. Carrying or wearing a Ruby can make it easier to focus on the task at hand, bringing clarity and wisdom. Placing a Ruby under your pillow will help you to have lucid dreams, many times overcoming fears as your conscious and subconscious minds connect. Rubies are thought to be the best stone to detoxify the blood, improve circulation, fight infection, and offer protection from disease. Contact me to place a custom order for your new Ruby jewelry. Mention this post and receive 15% off! Interview with Sabrinah, by "Around the World to the Left"
A new and truly interesting blog, Around the World to the Left, has featured Sabrinah's Art! A quickly-turning-popular blog with crazy SAHM stories, delicious recipes, and fun covos has conducted an amazing interview of Sabrinah. Read about the start-up of Sabrinah's Art, what inspires Sabrinah, and what it means to her to have a business of her own. Access great business tools and read about the challenges of starting your own online business. DON'T FORGET TO ENTER THE GIVEAWAY CONTEST! You could win a set of 6 wine charms made with genuine swarovski crystals! I designed a specific set of wine charms for "Around the World to the Left" with Motherhood in mind. I used some colors that gave me the feeling of being in “grandma’s garden.” There is light peach, violet, moonstone, champagne, aquamarine, and sage. The tags read, forgive, cherish, nurture, provide, protect, and comfort. I figure, if your wine is talking back, it might as well be saying something nice, especially for moms! ACCESS THE INTERVIEW, Check out the blog, and Enter the Contest! 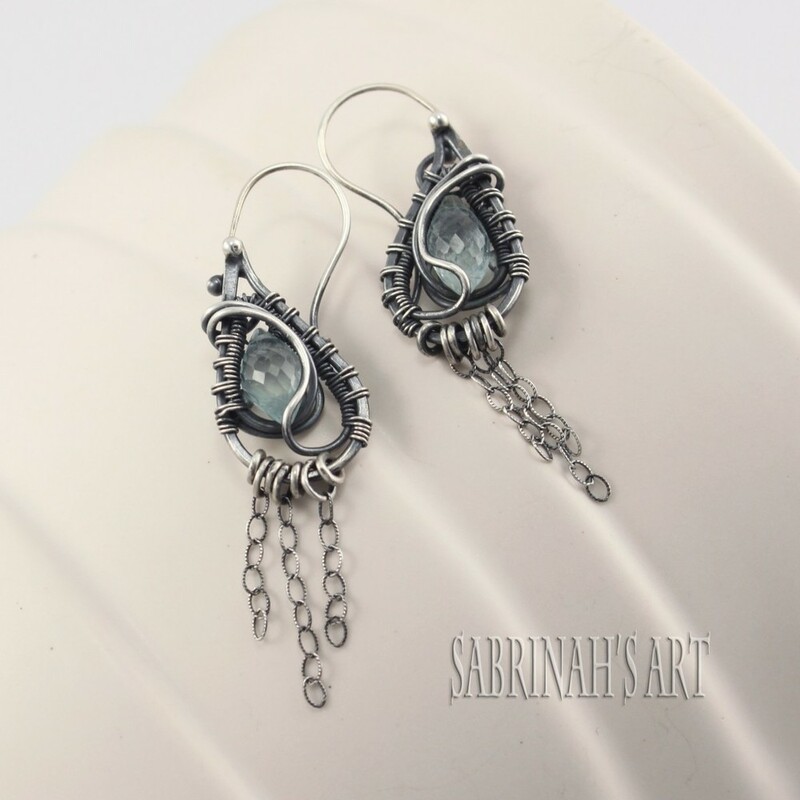 Don't forget to SHOP SabrinahsArt.com Great NEW PIECES available now! Our testimonials page shares special stories and photos from some of our most amazing customers. What could be more nostalgically beautiful than your birthstone, the Pearl? I have to admit, pearls were not always on the top of my "most wanted" list. They seemed like big, boring, round white beads. So what? It was only a few years ago when I finally discovered what pearls REALLY are; a lustrous, iridescent, gorgeously organic offering from an oceanic being. Now, I can't get enough of them. What is most interesting to me is that pearls are formed by an irritable "intruder" of sorts, which either occurs in nature or is placed there through implantation, such as with a cultured pearl. The oyster forms a protective covering around this irritation by making small deposits of calcium carbonate that form an outer shell known as nacre, to create what we eventually call a Pearl. A gemstone quality pearl is considered to be a precious gem, and must display extreme lavish qualities of luster, regular shape, surface quality, and increased nacre thickness, which determines the pearl's durability over time. On a metaphysical level, pearls provide a connection to the Inner Goddess. Pearls are cleansing and centering and their powers initiate purity, integrity and faith. Pearls are very nurturing, which is not surprising as we already know they have been in a constant state of overcoming irritation. These properties make Pearl jewelry a great gift for Moms, expecting mothers, and brides. Pearls are also great for men, as they open pathways to understanding women more easily. Physically, pearls will alleviate allergies, problems with the lungs, stomachaches, and headaches. They will stabilize hormone production, reduce allergies and prevent exhaustion. Pearls are expert energy absorbers and therefore need to be "decontaminated" often. Energy-cleanse in water and re-charge in moonlight. Never clean your pearl with chemicals, wear pearl jewelry in the pool or expose your pearl or pearl jewelry to cleaning products. I have found a GREAT product for cleaning pearl jewelry (any jewelry really) that is super safe and effective. It's called "jewel brite" and is a combination of banana and coconut oils and biodegradable cleaning agents. Did you know? Emeralds have been a prized gemstone since ancient times. Emeralds were popular with ancient Egyptians, and have been found buried with mummies. Emeralds also held popularity in ancient Rome, but it is thought that these "Emeralds" may have actually been Peridot. Like most colored gemstones, almost ALL Emeralds are treated to enhance their natural beauty. These treatments include oils and resins that camoflauge surface cracks and make the stone more transparent. due to this possible treatment, you should NEVER put your Emerald in an ultrasonic cleaning machine. It could destroy your stone! Of course, you should beware of faux Emeralds, but there is also what's called a composite Emerald, in which chunks of glass or other inexpensive materials are combined with a small, valuable Emerald stone. The only way to tell if you are looking at a composite Emerald is with a microscope. Your jeweler should disclose this information, so it's important to have a jeweler that you trust. The sacred stone of Venus, Emeralds strengthen and preserve love and open lines of communication. Emeralds can also be used increase clairvoyance and memory and to enhance truthfulness and faith. A universal symbol of hope and prophecy, Emeralds can assist in bringing wisdom and reason. Highest during a spring full moon, the powers of Emerald can help to strengthen the eyes and heart, and boost the immune and nervous systems. Happy Birthday, May! Use code EMERALD15 at checkout and save on all Emerald jewelry through May 31st. Interested in custom wedding jewelry? Visit my WEDDINGS page! Happy Earth Day!Earth is a huge inspiration when creating jewelry. The colors, textures, plants and animals that share our planet provide a continuous supply of imagery and beauty. By taking time to study the details that surround me, I find that the Earth activates my creative realm- a place where possibilities are endless, especially in jewelry. This year I've decided to grow a vegetable garden to gain inspiration and life-balance through growing plants. With the help of my husband, I built two raised garden beds. I decided to paint them a vibrant purple, which is not only my favorite color, but also a color of healing and tranquility. I know my garden will help me discover new things about myself as well as rekindle my appreciation for the Earth. It will feel great to get my hands in the dirt and be invigorated by the beauty of growth. Life has a way of wrapping up our minds which makes it easy to forget about living in the moment. Earth has a way of slowing things down, so we can take time to remember that we are actually alive. The Earth loves us, and it never stops giving. Every gemstone in every piece of jewelry you own originated from the Earth and vibrates with it's energy. Our planet is taken for granted, easily neglected and most of the time just plain disregarded, but there is no way we could survive without it. How about we try making Earth a priority? With all the craziness of everyday work and errands, it's not practical to constantly think about protecting the Earth. However, we can at least make an effort to increase the time we spend loving the Earth, and in turn, loving life. This Earth Day, make Earth your first priority. Plant something GREEN. Recycle everything you can. Give new life to something old so it can be reused. SLOW DOWN and take a moment to appreciate the beauty of a sunset, the smell of rain, the feeling of the sand between your toes, the detail in a simple leaf. Watch a colony of ants as they work together to accomplish an impossible task while leaving no "soldier" behind. Our Earth is truly amazing and Earth Day is a celebration of it's glory. Thank you, Earth. I am forever indebted to you and your endless beauty. I simply can't live without you! Happy Earth Day! 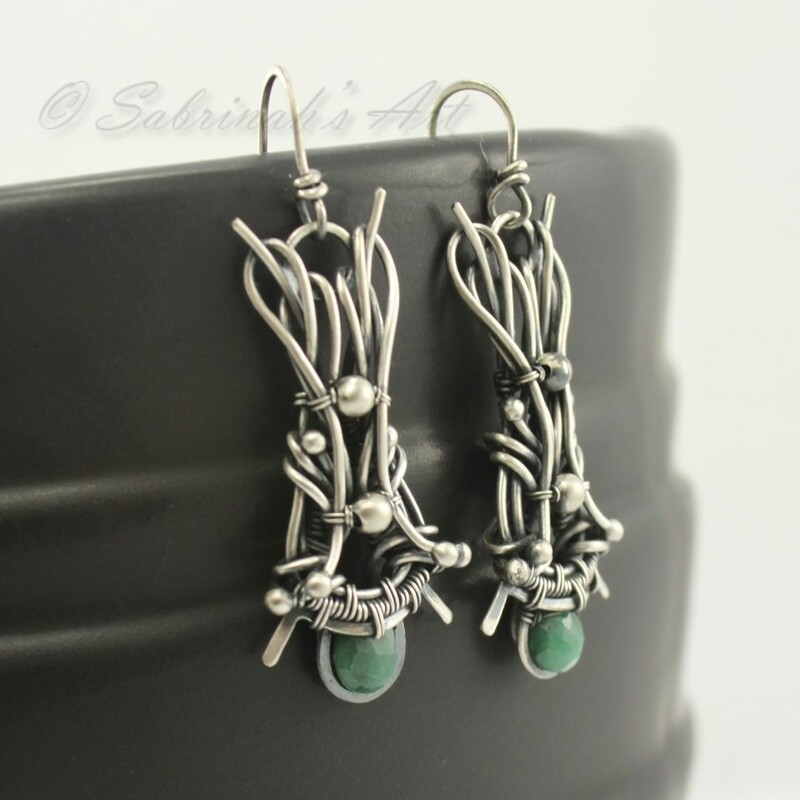 Let's celebrate with a sale... 30% off all GREEN jewelry in my shop: Use GREEN30 at checkout! Diamonds, known as a symbol of love, are also the official birthstone for April. Diamonds are made of pure carbon. They are not only the hardest gemstone on Earth, but also the hardest mineral. Clear diamonds are the most popular, but the demand for colored diamonds is growing as people are being captivated by the beauty of blue, pink, yellow, and chocolate diamonds. The "4 C's," know as Cut, Color, Clarity, and Carat, together determine the value of individual stones. "Clarity" is the word used to describe a diamond's level of flawlessness. A flawless diamond is very rare, especially as the size of the stone increases. Not to worry, if you have a diamond with a flaw, it can actually be a good thing. Think of that "flaw" as a "characteristic" of your diamond. It is like a fingerprint and is a great way to identify your stone. If you know where this characteristic lies within your diamond, you can be sure that your diamond never gets switched when you take your ring in to have it cleaned or repaired. Funny business avoided. It should be no surprise that diamonds symbolize love, but they also symbolize purity, innocence, and faithfulness. A diamond can be used to enrich one's sense of purpose and overall well being. They increase the vibration of all stones in their vicinity, making them even more of a treasure. A diamond can lesson jealousy, bring abundance, and provide a path to resolve problems using a positive approach. These are great attributes for an engagement ring, as well as any jewelry for those lucky April birthdays out there. Enjoy your jewelry! To celebrate April birthdays, I am extending a site-wide 15% coupon. Use code DIAMOND15 at checkout and save on every purchase through April. Spring is nearly here, and boy, am I ready. Although time seems to be passing at lightning speed, I'm feeling like this winter is dragging. I have my sights set on sun, beach, and sand. This month's birthstone is special to me- I am a March birthday, specifically the 20th, which heralds the equinox and the beginning of spring. The pastel blue hue of aquamarine is something I've always deeply admired, and I feel fortunate to be able to call this stone my own! I've been creating quite a few new pieces with Aquamarine lately, and being in contact with this stone has provided me with a gentle, soothing, creative energy. I have noticed an increase in my "sixth sense," being intuition, and others have noticed and commented to me about my increased "psychic" abilities as well. I also believe that my longing for the water and for spring in general has been enhanced by my handling of this tranquil, blue stone. As far as physical healing is concerned, the calming nature of Aquamarine is thought to be beneficial for lessening dependency on addictions. Because of it's relationship with the water, Aquamarine will purify and protect your kidneys and liver by controlling the fluid levels of the body. It is also cleansing and protective for the thyroid. 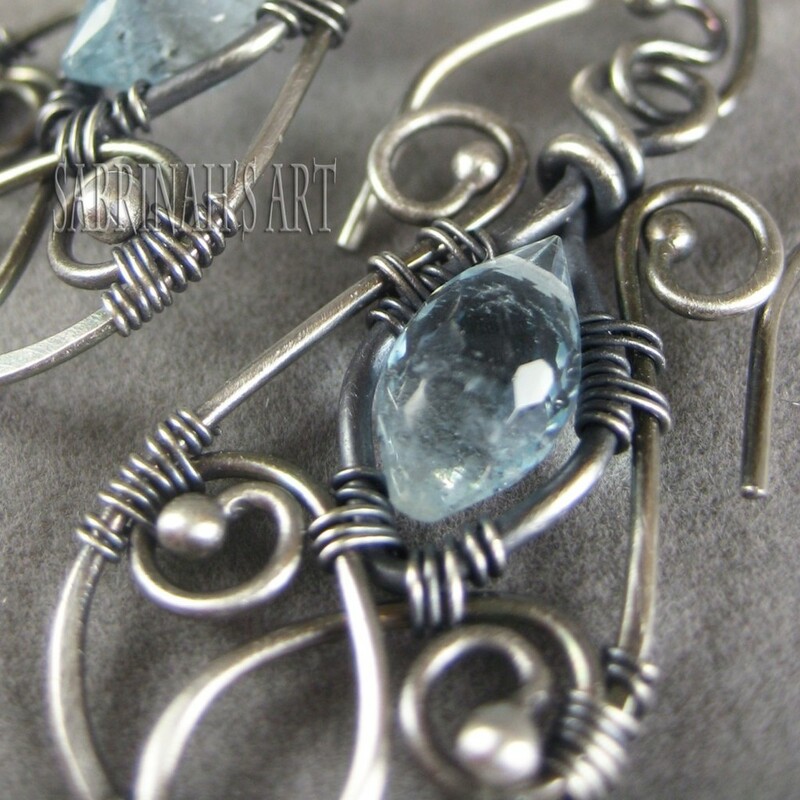 Mystically, aquamarine has been used since ancient times to protect sea travelers from drowning. I have Aquamarine set into my wedding band, and I think of this fact whenever I am SCUBA diving. It really is soothing to the mind. Aquamarine, literally meaning "sea water," is a variety of beryl that comes in delicate, oceanic hues of blues and greens. Nearly all aquamarine that you will see has been heat-treated to enhance or deepen it's color, which is common with most colored gemstones. Alchemists are still unable to artificially produce Aquamarine, which makes this stone even more special and appealing. In celebration of my birthday and the coming of spring, I am holding a Jewelry Giveaway Contest for all my Facebook fans. 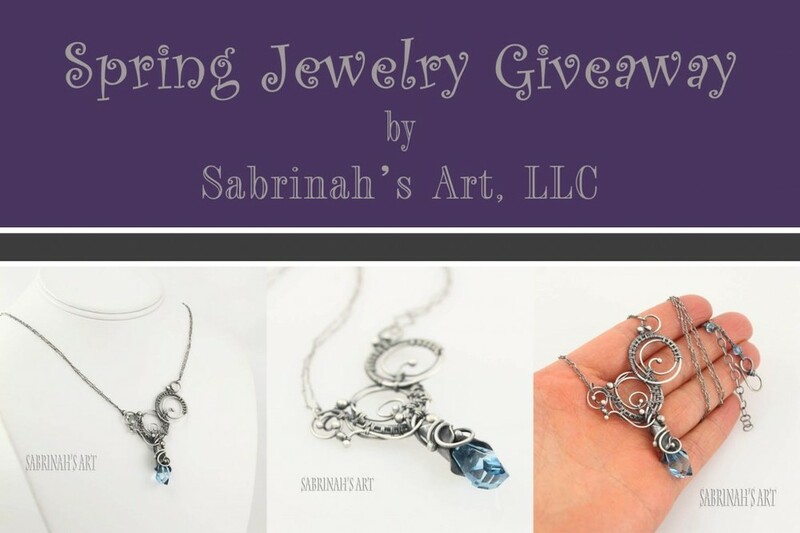 FAN my Facebook page and follow the instructions to win this "Spring Tendrils" Aquamarine Swarovski Crystal, Fine and Sterling Silver Wire Wrapped Necklace, worth $225! Ngorongoro, the "Cradle of Life"
Just north of Tanzania lies an ancient crater called Ngorongoro, formed by a volcano. This “Cradle of Life” contains rich soil and abundant water which make it a sanctuary for the animals and botanicals of Africa. Aside from its natural benefits, the Cradle of Life has also provided scientists with a plethora of fossil finds of early man, signifying its role in the support of human life for thousands of years. This geographic wonder inspired my design for this necklace, which is a commissioned piece for an expecting mother. Just as Ngorongoro cradles life, a mother cradles her new baby, sending rays of flourishing energy to her growing child. 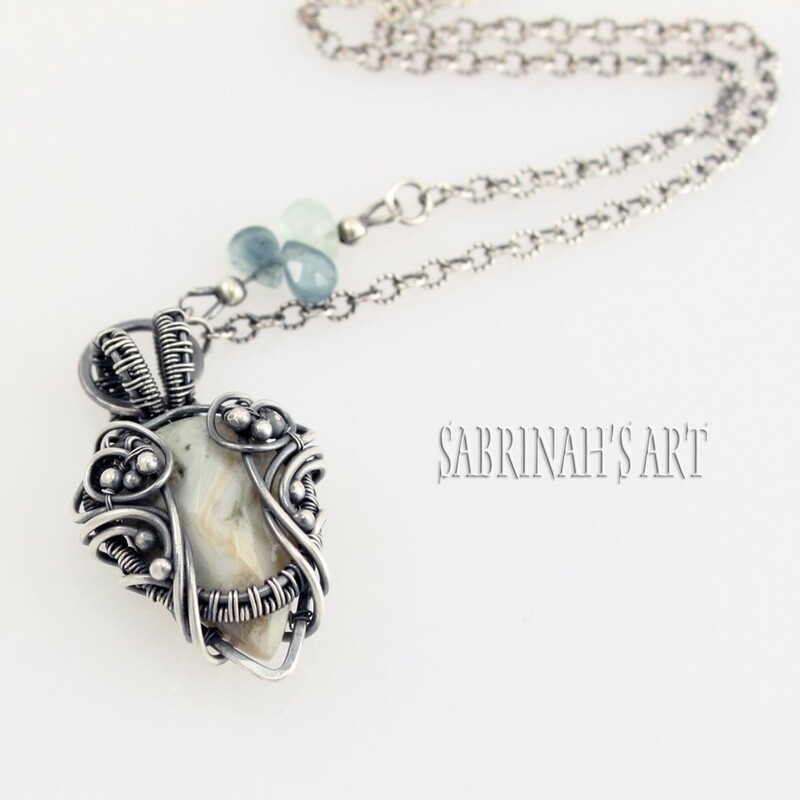 Physically, rainbow moonstone will assist in healing the female reproductive system, and will relieve pain associated with childbirth and breastfeeding. It is also a great stone for removing harmful toxins as well as any excess fluids, such as with fluid retention. The vibrant, changing color spectrum of Rainbow Moonstone is uplifting and energizing and may help to revitalize the emotions as well as the physical body. You are welcomed to the World, Baby Vega! View product listing and purchasing options. Like most people, I have always loved the water. There is something so soothing and tranquil about the way it sounds and moves. When I'm near it, I can't help but stare and imagine the mysteries that lie beneath. Is it the same for you? Since childhood I have been deeply fascinated by all the creatures of the Ocean. I feel that I have a bond with the Underwater World- the magnificently vibrant colors, the synergistic relationships between it's animals, and the beauty of it's most minor details. It is amazing to me that in the vastness of the Ocean we seek value in the luster of one tiny pearl. There is a great mystery to the Ocean, like a secret that no one has ever told. So much of it has never been explored and ike tiny bubbles, thousands of questions are continually rising to the surface. What an amazing thing to think that we really have NO IDEA what else, or who else, is living on Earth along with us. What about Mermaids? How many other species and families are living in the Oceans that we have yet to discover? Is a shark smarter than a human? I mean, there has to be a reason for it's ability to survive for millions of years. And whales... are they sleeping? Or, are they meditating? oooooh. It gives me goosebumps. It is a great desire of mine to share my Oceanic visions with you through jewelry inspired by the Sea. Please partake in viewing these fantastic new pieces. As usual, there will be more to come! A new year with new resolutions... and if you're thinking of a romantic resolution, Garnet is your gem. The official birthstone for January, traditional garnets have a deep, seductive red hue that chants, "You know you love me!" You might be interested to know that Garnets not only come in red, but also in orange, pink, yellow, black, and green. The rarest garnet is actually blue, originally found in Madagascar. This type of Garnet contains high amounts of vanadium, which makes the stone change its color from blue to purple when placed in incandescent light. No matter the color, Garnets are truly the stones of romantic love. They enhance sensuality and intimacy, and will attract a new lover or restore passion to current relationships. Garnets will also increase self-confidence, popularity, and boost energy levels. Garnets are known bring success not only in love, but also in business endeavors. Garnets will help to alleviate symptoms related to diseases of the blood and circulatory systems. Red Garnets are associated with the spleen and thyroid, and can provide assistance with cleansing and purifying the body. Garnets are also known as "mirror" stones, which means they will not absorb negative energies, but instead reflect them back to their origin. A good tool to have when dealing with someone bad-natured or vengeful. Gorgeous Garnets not your thing? An alternative birthstone for January is the Emerald, also a stone of love and romance. Additionally, Emerald is known to protect people during travel. December Birthdays, You are LUCKY! I know you have that whole, "my birthday is so close to Christmas, I rarely get enough gifts" complex (come on, it's a joke), but hey, you couldn't give birthstone status to a more gorgeous gem. Blue Topaz is a silicate, and crystal clear in its purest form. Due to trace mineral varieties during its formation, it may develop into a number of different colors, including BLUE, pink, yellow, green, and red. Either naturally or by man, topaz is heated to achieve it's vibrant blues which come in Sky (lightest), Swiss, and London (darkest). London Topaz is sometimes used as a sapphire substitute. Blue Topaz can be used to increase your level of compassion and kindness, and will protect your heart from falling for someone who doesn't really love you. You can also use Blue Topaz to enhance your creativity, especially to develop a plan for achieving dreams, the truest love, and success. Blue topaz has physical healing properties, too, and you will love this one... Blue Topaz is thought to speed up the metabolism, assisting in weight loss! Who doesn't want help to burn off all those Christmas cookies? Not to mention, Blue Topaz will assist in treating blood disorders and health issues related to the endocrine system. It also focuses on tissue regeneration, which can help reduce signs of aging. Still not enough for you, December? Turquoise is an alternative birthstone, which is a MASTER healing stone and a great stone for protection, both physical and psychological. The Saul Bell Design competition is for jewelry designers around the world. Presented by Rio Grande, the award is a challenge for designers to think outside the box and break through traditional methods of jewelry design. I've entered my newest creation, the "Vanishing Point" necklace, made from fine and sterling silver wire and Tourmalinated Quartz. Each and every component is hand made, including the individual chain links. 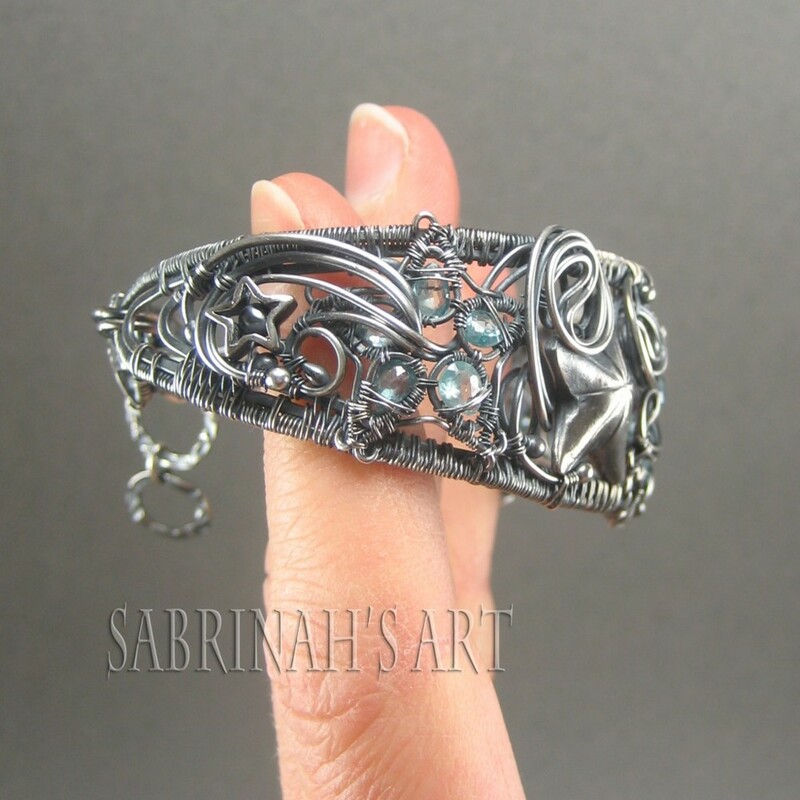 This piece is entered in the Silver/Argentium® Silver category. The name "Vanishing Point" was inspired by the vanishing point technique in linear perspective drawing, where all lines converge toward the center. I thought this Tourmalinated Quartz stone was perfect for this idea due to it's clear color with the tourmaline stranding, as the tourmaline crystals seem to "disappear" within the stone. Tourmalinated Quartz is a powerful stone for balance. It is a great problem solver and can help turn negative thoughts and energies into positive ones. It will aid in detoxification of the body and alleviate digestive issues. Grand prize is a $10,000 gift certificate to Rio Grande Jewelry Supply. Finalists will be announced in November. Keep your fingers crossed! I can't wait to see all the friendly faces at the Rio Grande Balloon Fiesta Show. I will be in BOOTH C22 from October 12-14, 2012 with lots of new pieces for you to see! I've been working hard in the studio touching up my displays, too. Here is a pic of the display for my hot air balloon pendants... cool, huh? Come and visit my booth this weekend and enjoy the Balloon-dotted skies of Albuquerque! My husband and I recently returned from a fabulous trip to Hawaii, on the island of Kauai. I have never been so inspired by the beauty of the Earth and Ocean. After a short and beautiful hike, we ended up at the "Secret Lava Pools" where the waves were crashing against the lava rock coast. A sea turtle was somehow swimming among the waves right at the rock line. So close it seemed I could reach out and touch him. It was an amazing sight! This pendant represents the sun, waves, lava rock coast, and turquoise color of the ocean, with the sea turtle swimming out from the waves. I made it for the GIVEAWAY contest because I think everyone should enjoy the beauty of Kauai, especially in the form of jewelry. You could WIN this gorgeous Kauai-inspired pendant made of sterling silver-filled wire, sterling silver wire, lava rock, and apatite gemstone, laced on a sterling silver chain. ALL REQUIREMENTS must be met to win this pendant! The winner will be selected on Friday, August 17th. GOOD LUCK! Wow. What an AMAZING show. I "heart" you, Albuquerque! I was happy to have the help of my dear friend, Heidi, to take me (and my entire booth) to set-up this past Thursday. It went super-smooth and we were out of there in under 3 hours. Saturday and Sunday were very busy days at the show and I talked to so many people who just loved my jewelry. It made me feel warm and fuzzy. Here are two sweet customers who purchased jewelry- Thank you so much! I can tell that there is much appreciation for the arts here in New Mexico. Many of my customers suggested that I do the Balloon Fiesta this October. So, today I applied! Keep your fingers crossed!! My sweetheart drove to Albuquerque on Sunday evening to help with the clean-up. We were done in less than an hour, with EVERYTHING fitting into my little Honda Fit! Wooohooo! Thank you SO MUCH, Albuquerque! Hopefully I will see you all again in October! My newest bangle is inspired by the Pleiades, a cluster of 7 stars in the constellation Taurus. Pleiades resides in our galaxy, and is approximately 500 light years away from Earth. The Pleiadians, an ancient, human-like race originating from Pleiades, discovered Earth during space exploration. They entered our cycle and stayed with us through many of our world's transformations, guiding us to a more spiritual path. 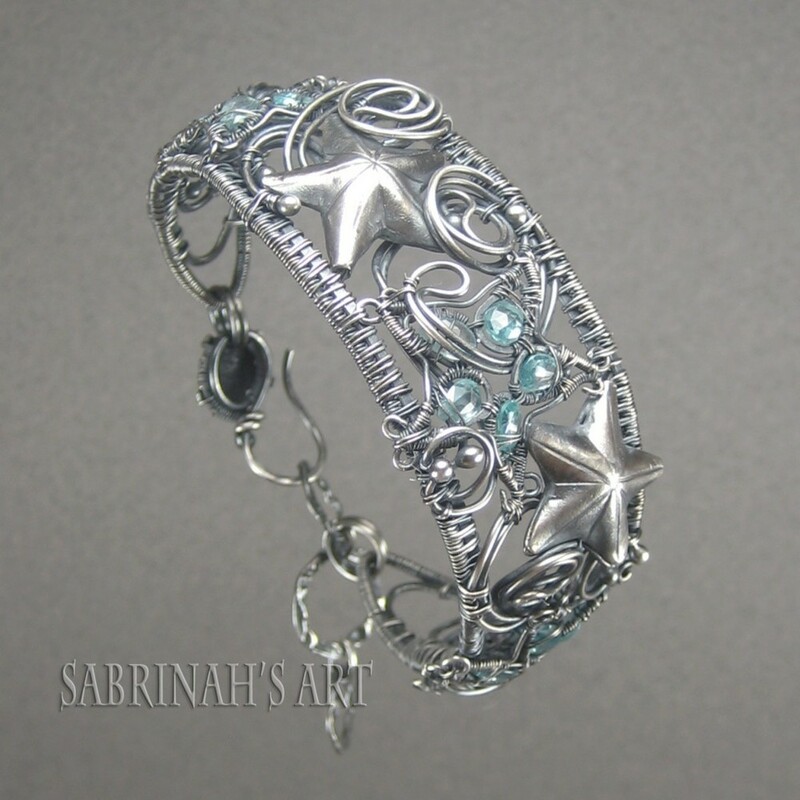 This bangle has seven stars, representing the Pleiades cluster. Included are 3 stars made from Blue Zircon gemstone briolettes. Blue Zircon is said to stimulate all chakras and open the doorway to higher realms. It energizes psychic abilities and allows one to easily identify and accept spiritual guidance.